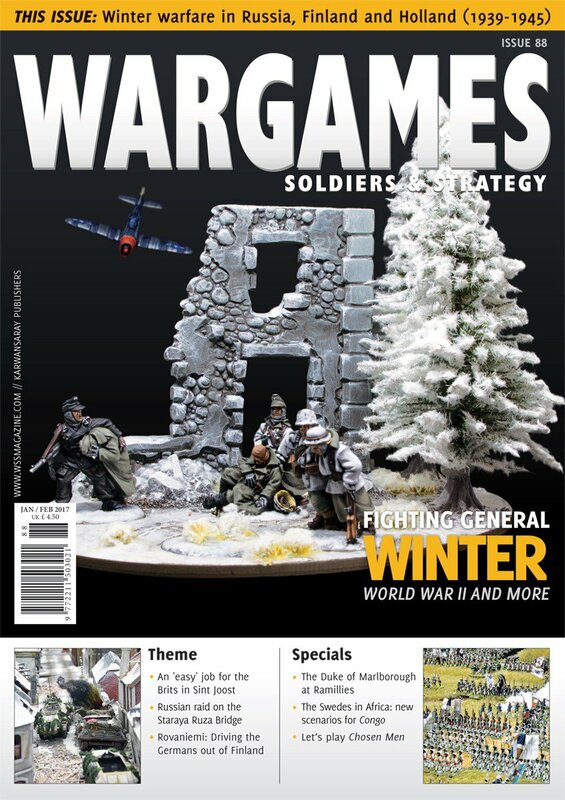 This issue's theme is particularly relevant for the season, as it examines winter warfare in the period of 1939-1945. While we look at a variety of battles from this time that take place in snowy conditions, there's a special focus on the Germans and Russians in Finland. Column: Richard Clarke, "Up front - Sigmoid curve"
Switzerland, 1891. The lobby of the Wargamerisch Hof. Two gentlemen enter stage left. Cue pianist with terrifying refrain. Bitesize battle: Adrian McWalter, "Bitesize problem solving: Frontal assault - Conquering the crags"
I have always been interested in creating scenarios that give the combatants a few interesting problems to solve before they can achieve final victory. I have a collection of scenarios that fit the bill, created so that they are capable of being played against almost any wargaming backdrop and that they cater to most rules systems. Feature: Michael Leck, "King Leopold's mercenaries in the Congo Free State"
After Belgium and the United Kingdom, Sweden was the land that provided the most men to serve for King Leopold II in his pursuit of creating a personal colony by the Congo River. By 1883, about 30 Swedes had been enlisted by Henry Morton Stanley to participate in his initial exploitation of the land and the creation of the Congo Free State. By the time the Congo Free State ended in 1908, at least 600 Swedes had been in the service of King Leopold II; about half of them were officers. Feature: Martin Gibbins, "Spanish and Seleucid forces for Project 217 BC - Armies for Swordpoint"
As many of you will already know, Wargames, Soldiers and Strategy is launching a global campaign set in the year 217 BC. It is a time when virtually every ancient state was at war with each other. Here are some project-appropriate lists for the new game. Feature: Paul Robinson, "Marlborough's finest hour - Ramillies refought"
I know, I’m a very fortunate wargamer. I’m a member of an enthusiastic, capable club with similar interests and resources to fight the Wars of the Spanish Succession with large collections over wonderful terrain. And we have done so countless times; but not Ramillies, not yet. It proved to be the largest game we’ve ever done in terms of figures on the table top. Tabletop tactics: Henry Hyde, "Tabletop tactics - Starting point: Tactics defined"
Theme: Warwick Kinrade, "Gaming winter campaigns in WWII - Welcoming General Winter"
To the WWII wargamer, winter battles in the picturesque snow offer a unique, problematic, but oh-so-tempting proposition. There’s a lot to choose from, and each has its own draw, be it the Germans freezing on the approaches to Moscow in 1941 and facing a Russian counter-attack, or Finnish Jaakari and elite Sissi ski troops (or German mountain troops) raiding the vital Murmansk railway line in the far northern Karelian Front, or the attempted breakthrough to besieged Stalingrad in 1942, or Kharkov or the Battle of Bulge, to name a few of the more obvious ones. Theme: Matt Bisek, "The Russian bear frozen by Finnish blizzards"
The battle of Suomussalmi in eastern Finland (December 1939-January 1940) pitted the outnumbered but resourceful Finns against the numerous but poorly led Russians. The Finnish defense was orchestrated by well-led, disciplined troops knowledgeable of the landscape and elements, and using tactics best suited to those circumstances. Theme: Warwick Kinrade, "Fighting against the soviets and General Winter - Raid on the Staraya Ruza bridge"
The German assault on Moscow of October and November 1941 finally stalled completely on December 5th in deep snow, fought to a standstill within sight of the Kremlin’s towers. German intelligence had estimated that the Soviets had no more reserves left, so a counteroffensive was very unlikely. However, that very day an unexpected Russian counter-attack swept the German advance back, catching them completely off guard. They were forced into full retreat, freezing due to poor equipment and trying to avoid complete destruction. Theme: Piers Brand, "A frost reception - An easy job"
In mid-January 1945, the British Army launched the rather wonderfully named Operation Blackcock with the aim of driving the German 15th Army back behind the rivers Rur and Wurm, pushing the frontline further into Germany and clearing the ‘Roer Triangle’. Theme: Eoghan Kelly, "The Battle of Rovaniemi, October 12th & 13th 1944 - The last train from Trans Central"
In the summer of 1944, Finland was on the point of concluding an independent peace treaty with the Soviet Union. Finland had fought the Soviets as part of the Continuation War, and although her troops had performed well, the country did eventually fall. Surprisingly, the Soviets agreed to a relatively benign peace treaty, under the condition that Finland expel all allied German troops from its territory. Theme: Guy Bowers, "Building an army for chilly conditions - Winter warriors"
General Winter brings new challenges and new cool-looking models to the tabletop. Some troops will have been issued snow camouflage gear while others will struggle on with greatcoats, using white sheets as camouflage. Theme: Andres Amian, "On the cover - Achtung, Jabo!" The story behind this dramatic scene is clear, I think. It’s a group of Germans in retreat, looking for shelter when suddenly an American airplane appears in the scene from behind. The miniatures were given to me by Warlord Games, and they are part of the casualty set from their new Winter German range. The base was a Sarissa Precision big artillery base and the ruins are part of the plastic ruined farm from Warlord Games. I mixed in a couple of 4Ground snowy trees to good effect. The little airplane is by Scotia Grendel. Column: Rossco and Raif Watkins, "The irregular - The generation game"
As a club we’ve run participation games at shows, and at my local club (cue tacky plug) ‘The Brixham Berserkers’, we do welcome younger gamers; but I wonder, is there more we can do? Then there is Raif, my 13-year-old son. He’s a gamer too. Like father like son! Hobby: Stephen Tunmore, "Dividing up your American wargaming table - Don't fence me in"
Battles in North America during the eighteenth and nineteenth centuries often took place on cultivated land and homesteads which had various types of boundary fencing. This feature will show you how to make some of the variations of fences present during these times, and I’ll help you improve them if you already know how to make them. Hobby: Ruben Torregrosa, "The best light cavalry of the ancient world - Painting 28mm Numidians"
On his way to Rome, Hannibal Barca increased his army by adding in the best soldiers he could find. At that time, Numidia produced some of the best light cavalry in the world. However, in a twist of history, Hannibal would later face the same Numidians and their skills at Zama. In this article, we show you how to paint these famous warriors using the fantastic new plastic models from Victrix Miniatures. Let's play: David Davies, "The new Napoleonic game by Osprey - Let's play Chosen Men"
Napoleonic players are perhaps the luckiest of wargamers, having a myriad of different Napoleonic era wargames to choose from. But that ‘luck’ can also be a curse: which one of the dozens and dozens do you choose? Now Osprey has entered the fray for the second time (let us not forget Field of Glory – Napoleonics), with Chosen Men. How will this new set of rules fare? Reviews: Chris Payne, Rossco Watkins, Raif Watkins, Mark Backhouse, "Game reviews"
In this edition of game reviews, our writers take a look at The Pikeman’s Lament, Rogue Stars, Skirmish AFRIKA, and VII Corps: The Somme 1916.